Canada's Anti-Spam Legislation (CASL) ensures that businesses and individuals reduce the harmful effects of spam and related threats to electronic commerce. An internal compliance team was created to address the legislation and ensure that all of Scotiabank's communications are compliant, and to mitigate possible liability. We need to implement the requirements of CASL as interpreted by the internal compliance team with minimal impact to existing products. The initial proposal provided by the internal CASL team, while entirely compliant, offered the following challenges. 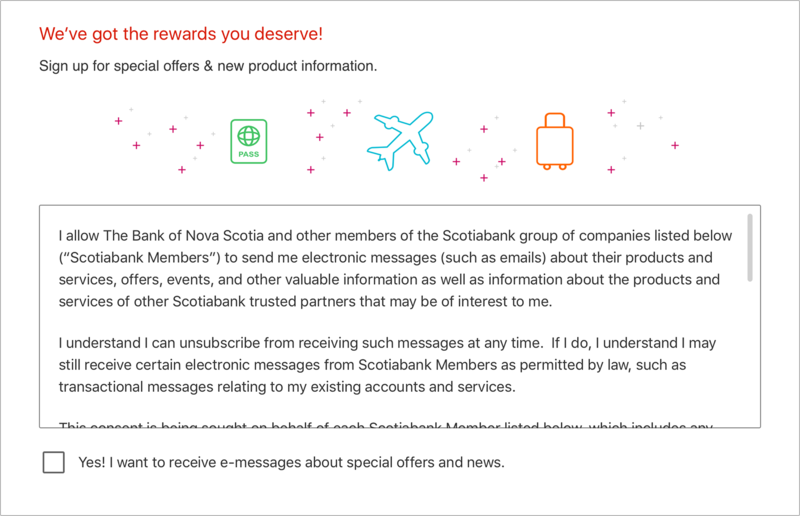 Incentive is ambiguous - "Join the millions of Canadians that receive valuable messages and rewards..." could be misinterpreted to include service messages. Overwhelming - The lengthy legal language and list of entities, along with the presentation of the scroll box may be visually and comprehensively overwhelming. 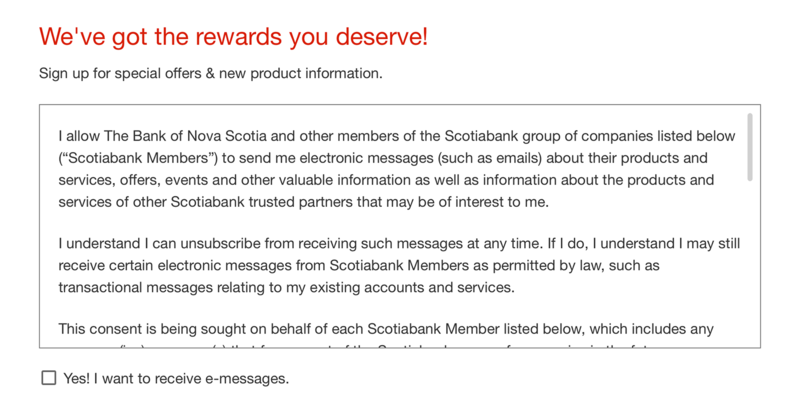 Friction of choice - The available options "Ask me later" and "Yes, I want to receive messages from Scotiabank" are not entirely distinct choices, rather they may create momentary confusion which could create additional friction towards the primary task aside from the marketing message offer. 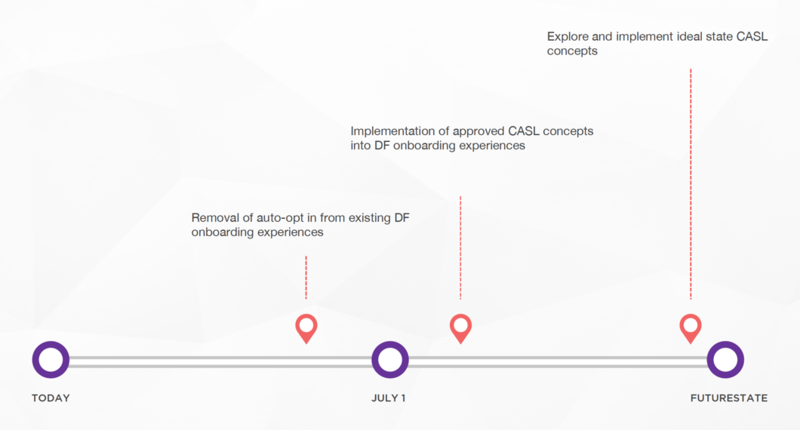 We focused our research on the requirements of CASL itself, the limitations as defined by the internal CASL team, and the needs of other designers in a variety of experiences that will be required to implement any solution. We presented our concerns with the initial proposal and worked with the internal CASL team to determine potential areas of improvements. After a couple of reviews with the internal CASL team and the legal team, we were able to narrow down our choices to two options for immediate execution. To address our immediate problem we delivered two working solutions on time. Yet, we're compelled to offer other solutions in service of a better customer experience. It's important to adhere to what is required of us, but sometimes we need to look beyond those limits, as interpreted by the internal CASL team, in order to provide a better customer experience. Offering simplified language provides a level of transparency that builds trust with customers. Along with our extensive research with competitors, other industries, and examples provided by the CRTC, we designed idealized concepts that are more than just CASL compliant. We've also taken into considerations a better experience by removing the scroll box entirely, especially in limited viewports like mobile experiences. Focus management, tap area, and overall available viewing area are big factors in trying to keep the entire opt-in component as small as possible. While it would be easy to just do what you're told, as designers, we take it upon ourselves to be fierce advocates for the customer experience. Remember to give full consideration to the people who are using our digital products and make their lives easier, to offer them the benefits of their patronage rather than force business needs on them. Ultimately, we're able to compromise with the requirements of the internal CASL team while pushing for a better customer experience. Two concepts are available for immediate execution and designers are able to choose from either option to meet their need. Additionally, we proposed other concepts for future consideration. Used at the right time and place, it could be more effective at converting opt-in rates.